Are your hands itchy to play online Poker with your Bitcoin? BitStarz offers great tables to play at especially if you are looking for a quick way to earn or spend Bitcoin. Just visit their website bitstarz5.com and scroll down, under the “Games” column click on “Table Games” and you will be redirected to their available table games without registering to try them out first. Today we will be taking a tour into their Poker department. Ante – This is your first bet. You can choose from denominations of 1,5,10,25 and 100. Pair Up -This is one of the moves that you can do prior to the cards being delt. If you place a bet under “Pair Up” this will be the same value as your original Ante bet. You win 2x the value of the bet you placed down if you have a pair in your hand. You lose the bet if you do not have a pair of cards in your hand and you will lose the betted amount. Minimum bet is 1 and maximum is 100. Once the game starts the dealer will hand over three cards per side. On the first deal, you will not see the dealers cards and rely on your instinct and hand you can either choose to Fold or Play your hand at this stage. Hitting the Play button will automatically get another bet from your bank which would be the same as your Ante. In the screenshot provided you can see that 100’s are being placed under “Pair Up”, ANTE and PLAY. The total bet placed on the table is now 300 chips. After every game, you are able to change your Ante if you feel it is too small or too huge for your luck. Raise – Bet double of your first bet and the dealer will open three more cards. 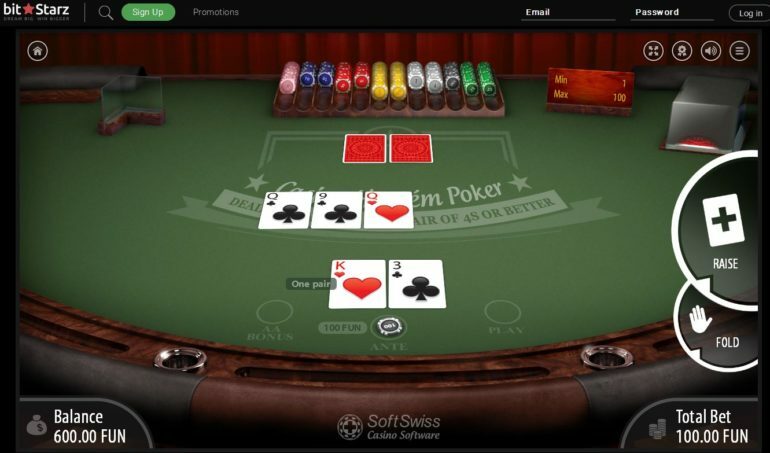 Turn – Same as the first bet (100), the dealer will open up one extra card. 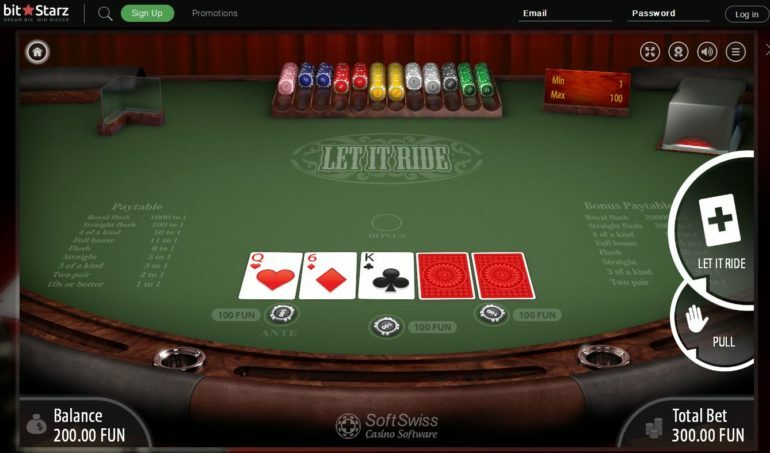 River – Same as the first bet (100), the dealer will open up the last card. Just like the regular Texas Hold’em Poker the game starts with two cards per side (2 cards for the dealer and 2 cards for you) after you have placed your Ante. At this stage, you will be able to choose to either Raise or Fold. Of course, if you choose Fold you will lose your Ante and another game will start if you want to move forward. If you choose Raise, the dealer will open up additional 3 cards in the middle and you will bet x2 your Ante. At this stage, you can either choose Bet or Check. If you choose Check, the dealer will open up another card without adding chips to the pot. If you really feel lucky you can click Bet and hand over the same value as your Ante and the dealer will open up the fourth card. Of course, at this point, you can Check or Bet. If you choose to Check, no further chips are needed and the dealer will open up the last card for the River, again you will bet the same amount as your Ante. Between betting and checking, there is no option to Fold. Once the game ends you can choose from either “Rebet” or “New Bets” if you feel you want to change your Ante. Raise – This doubles your first bet. So if you have 100 as Ante, this would automatically place 200 at the table for you. Raise or Fold – Would be given after the Dealer gives out 5 open cards on your end. Shows one card on the dealer’s side and have the rest (4) of the cards face down. The game starts with the dealer giving out five cards on your end and 5 for his side. 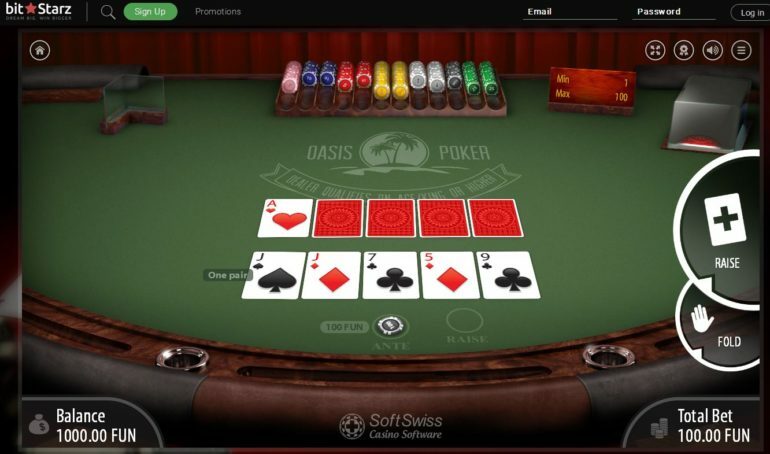 The dealer leaves one card open and at this stage, you will be given the chance to Raise the bet or Fold. Choosing Raise will place another 200 chips on the table and the dealer will open up his remaining four cards. Of course when you click Fold the dealer keeps your Ante. 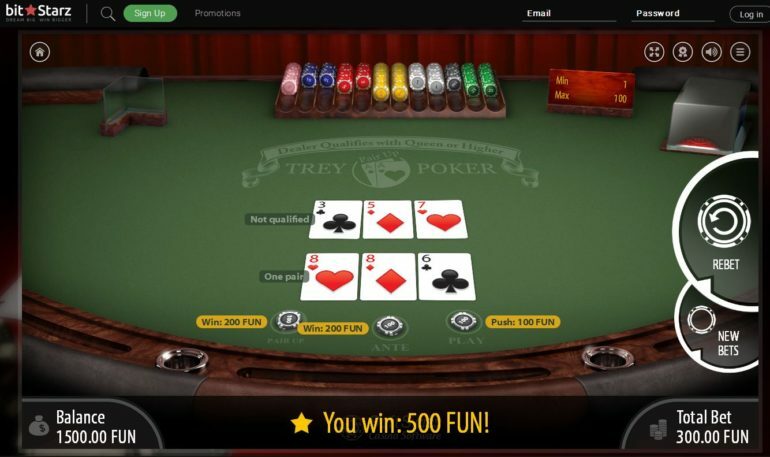 Oasis Poker is as quick as Trey, this game is best if you think that you are having a lucky day. The game starts right after you choose your bet. If you choose 100, 300 chips will automatically be deducted from your bank. You can either choose to “Let it Ride” and keep your bets down or choose “Pull” and get one bet out of the table. First click of “Let it Ride” would open up one of the two cards being faced down. At this point, you can either choose to pull one bet off the table or let it ride. How do you win? Here is the Paytable below. Remember, you are playing against the dealer. If you have nothing in your hand then you win nothing. If you are lucky to have a Royal Flush in your hand then the odds are 1000 to 1. That means that you have 1000 chips for every 1 chip bet. What matters is the first three cards that will be dealt. If you see nothing on the first three, better pull out until the last card. The game of “Let it Ride” is simply a luck game and little skill is required to win. 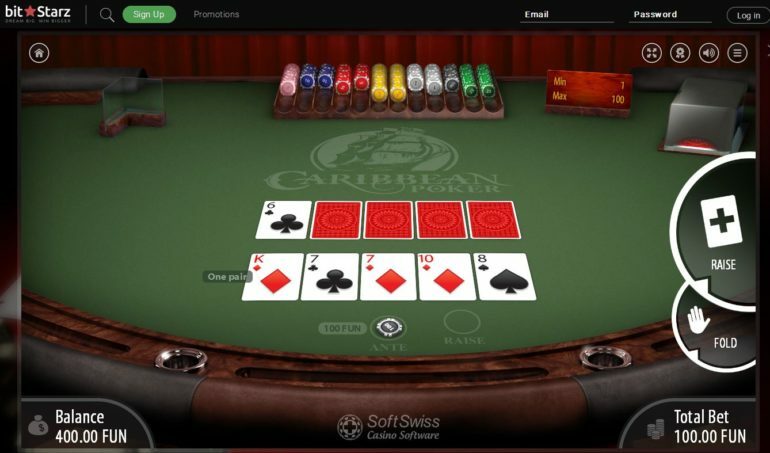 The game Casino Hold’em starts by choosing your Ante. Once you have decided how much you want to bet, you can choose to have a double A bonus or go on with it. Once you click on Deal, the dealer will give you two cards, two cards for his side and three open cards in the middle. At this point, you can either Raise or Fold. When you click on Raise you will place additional chips on the table two times the value of your Ante. If your Ante is 100, this would place another 200 and would raise your total bet to 300. The dealer will then open up two additional cards in the middle. Of course, if you Fold you lose your Ante and the game ends. The game is similar to Oasis Poker. bitStarz is a place where you can just choose a Poker game of your choice and try your luck for the day. Poker is all about the feels. If you do not feel like playing on that website then do not force yourself. 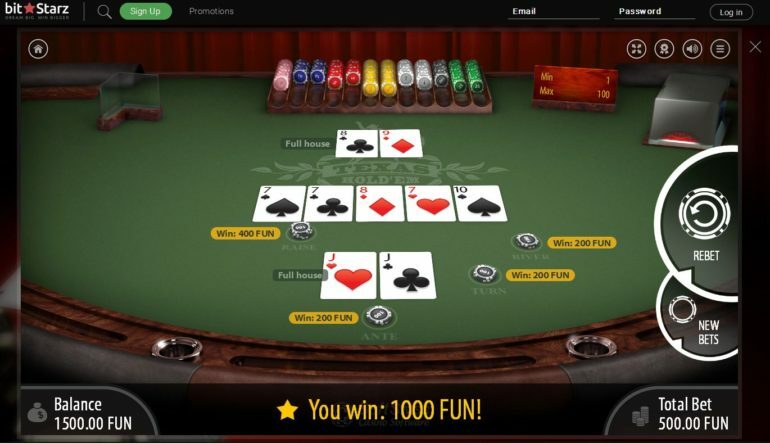 That’s great because with bitStarz you are able to play their Poker games for free and if you think the website and tables feels right then that would be the time to register.